An In-Depth Guide to Representative Offices in Indonesia Review by tenissa.tjahjono on 26. 4. 2018 Company Registration in Indonesia, Market Research in Indonesia, Work Permit in Indonesia, Product Registration in Indonesia, Local Partner Selection in Indonesia, Trade Mission in Indonesia, Company Formation in Indonesia, Company Establishment in Indonesia, Company Set Up in Indonesia, Payroll Outsourcing in Indonesia, Tax Reporting in Indonesia, Medical Product Registration in Indonesia, Medical Device Registration in Indonesia, Cosmetic Registration in Indonesia, Food Supplement Registration in Indonesia. To simplify the investments for foreigners in Indonesia, the Indonesia Investment Coordinating Board (Badan Koordinasi Penanaman Modal “BKPM”) has just announced the implementation of two new groups of regulations on investments. One of the rules related to Regulation No. 13/2017 on The Guidelines and Procedure for Capital Investment Licensing and Facilities is the changes in the division of representative offices in Indonesia. The issuance of BKPM’s Regulation 13/2017 acts as an implementation of the 16th Economy Policy Package in Indonesia in regards to the Acceleration of Business Operations. The changes aim to make investment facilities procedure and licenses in Indonesia simpler. See the impact of simplification of regulation; check Ease of Doing Business in Indonesia for 2018. Under the enacted regulation of 13/2017, BKPM is currently allowed to approve the representative offices for construction, and representative offices for oil and gas, in addition to the existing two types of representative offices. Other key changes under Regulation 13 related to representative offices also include the removal of the limited 5-year validity license for regional representative offices. KPPA is usually created for you to have a market presence without large capital investments, before starting a business in Indonesia with a PT PMA. It is a general representative office as compared to a trading representative office which is established for management purposes. To set up a KPPA in Indonesia, you will have to submit an application to the BKPM via director or manager of the foreign company or director in Indonesia appointed on behalf of the company. You can also get a lawyer for this purpose as the process might get a bit more complicated. A KPPA must be located in provincial capital cities, in an office building. KPPA license is valid for 3 years and extendable without limitations with the validity period specified in the appointment letter. This license could only be extended for a maximum of two years before Regulation 13/2017 took effect. Supervise, liaise, manage, coordinate and represent its affiliated or parent company abroad. Get ready to establish and develop a foreign-owned company in Indonesia. Be a member of company management, branch or subsidiary in Indonesia. Generate any revenue through sales or purchase transactions and other sources in Indonesia. Three types of KP3A are: selling agent, manufacturing agent and buying agent. Selling agent is to perform liaising and promotional activities; manufacturing agent is to perform market survey; and buying agent is to supervise and liaise. If you set up a KP3A in Indonesia, trading activities or sales activities are not permitted. Both KPPA and KP3A do not give you the benefits to do business for revenue purposes in Indonesia. However, you are allowed to open a branch office in any part of Indonesia, which a KPPA is not able to do. In order to be able to manage a KP3A, you need to be an individual with higher educational background and experience in related fields to be eligible. KP3A serves to promote products in Indonesia for its mother company overseas. The application process is the same as for KPPA, only that submitted documents need to be notarized in the country of origin, and then legalized by the Indonesian Ministry of Foreign Affairs. The office must be located in provincial capital cities or other districts/cities within Indonesia. To apply for KP3A, a license called SIUP3A is required. There are several different kinds based on the function of your representative office. If you are a construction company with B or B2 business qualification, you can register for a BUJKA. B qualification stands for planning (Perencana) and B2 for implementer (Pelaksana) activity. Unlike KP3A and KPPA, you are able to execute projects in Indonesia with BUJKA with a local construction organisation (BUJK) (100% owned by Indonesian) via a joint operation. The permit is valid for 3 years and is extendable as well. BUJKA’s license application, replacement and renewal fees fall between US$5,000 and US$10,000. Fee varies based on the active business field that the BUJKA participates in. With BUJKA, it allows companies to do market research and liaise with other companies and institutions. It can also be involved in the procurement of construction services, and assign Indonesian or foreign manpower to manage the office. The application and documents are required to be submitted to the Ministry of Public Works. The administrative fees are US$5,000 and US$10,000 for construction consultancy services and construction implementation services respectively. BUJKA license application requires more paperwork than other representative offices and you must prove your company have a good reputation with considerably larger operation. There are no exact restrictions of a KPPA MIGAS, however, it is of the general consensus that KPPA MIGAS is regulated in the same way as KPPA. Foreign companies with their field in oil and gas can now establish a KPPA MIGAS in Indonesia. It was not regulated by BKPM previously and the permit is also 3 years which can be extended. 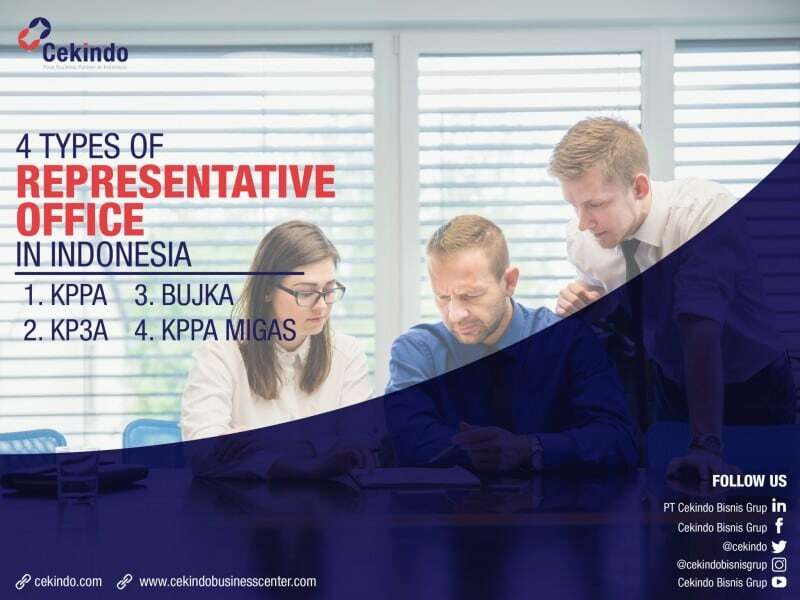 Interested in opening a representative office in Indonesia? Contact us now or fill in the form below to boost your market presence as the very first step to start your business in Indonesia! hello we are having a coal trading company in singapore (Buying from indonesia and selling to India and china) and we r looking forward to open a rep office in indonesia. After we open Rep office will our trading profits in Singapore is taxable in Indonesia due to presence of Representative office. kindly send us the requirements & the price to open Representative office. Thank you for your message. Our consultant has reached out to you regarding your inquiry.